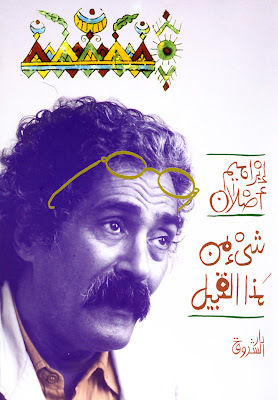 Since he emerged on the literary scene in the mid-1960s with his elliptical, allusive, deceptively simple short stories that deeply impressed culture mavens Naguib Mahfouz, Latifa al-Zayyat, and Salah Abdel Sabbour, Ibrahim Aslan has been elaborating and perfecting a genre all his own. Mixing fiction with autobiography, short story conventions with novelistic forms, poetic economy with dramaturgical composition, Aslan’s art is a precious, wondrous creation. He has the poet’s ear for language, the painter’s feel for texture, the composer’s sense of movement, the layperson’s love of humour, and the photographer’s knack for finding the magic in the mundane. Aslan’s latest work, Shay’un Min Hadha al-Qabil (Something like That), is a collection of the author’s terse and evocative columns in al-Ahram and al-Karama written in the past two years. Reading them once a week among the grim fare of news and opinion was like a breath of fresh air, a momentary flash of mystery and beauty amidst mind-numbing ugliness. But reading them in succession in a single volume is a more intense, absorbing experience, inviting contemplation of just what it is that makes Aslan’s writing perennially fresh, profound, and pleasurable. Aslan is by far my favourite writer among his contemporaries. While very readable, Sonallah Ibrahim’s work is highly cerebral and lacks beauty (with the exception of his latest oeuvre). Baha’ Taher has become too transparently didactic and self-conscious in his writing, Khairy Shalabi’s storytelling is exuberant but unrestrainedly verbose and showy, Gamal al-Ghitani’s prose is too opaque and impenetrable, and reading Edwar al-Kharrat is grim work, what with all of his avant-garde philosophising. Mohamed El-Bisatie’s writing comes closest to Aslan’s poetic power and economical style, but his fixation on village life over-relies on predictable themes and characters. Like his contemporaries, Aslan conceives of writing as a medium to communicate with and prod the reader, but unlike many of them, his writing has a very light, ethereal touch while still making a profound impression. He does not moralise or philosophise, nor does he use writing simply to experiment with technique or engage in word play. He doesn’t write to shock or condemn or complain. He writes for the same reason a painter puts brush to canvas or a composer puts pencil to music paper: to give form to some inchoate thought or inspiration and to share it with others. From his first published collection of short stories Buhayrat al-Misa’ (Evening Lake, 1971) to his present collection of vignettes, Aslan’s sources of inspiration have been Melete and Mneme, the muses of meditation and memory. As with his vignettes in Khulwat al-Ghalban (Poor Man’s Hermitage, 2003), the 34 meditations in Shay’un Min Hadha al-Qabil (the title comes from an obiter dictum on p. 63) draw on Aslan’s memories from childhood and his early working life, as well as his quotidian interactions with peers, acquaintances, and neighbours. There are sketches of cultural figures Yahya Haqqi, Naguib Mahfouz, Mohammad Auda, and George Bahgoury, visits to St. Petersburg and Dostoevsky’s house, and everyday encounters with neighbours, Aslan’s car mechanic, a loquacious taxi driver, an exhausted old man, a besotted young newspaper seller, the author’s third grade English teacher, and a rural migrant to the city who’s written a real letter to God that Aslan surreptitiously filched from the undeliverable mail bin back when he worked at the postal service. None of these scenes are more than 2-3 short pages long, and the first five in the book are particularly revelatory of Aslan’s graceful melding of memory and meditation. Of course, Imbaba serves as a sort of hidden motif. As is well known, the neighbourhood where Aslan was born and has lived all his life has featured centrally in his two novels, Malek al-Hazin (The Heron, 1983) and Asafir al-Nil (Nile Sparrows, 1999), and his short story collection Hikayat min Fadlallah Uthman (Stories from Fadlallah Uthman, 2003). But here, evocations of his beloved natal quarter have a special poignancy. As the author mentions, he has moved from Imbaba to a new domicile in Moqattam, an experience whose logistical and psychological dimensions are most beautifully explored in these etudes. In small, precise gestures, this collection reveals much about Aslan’s life and art. We learn that one of his inspirations for becoming a writer was reading Anton Chekhov’s “The Death of a Government Clerk.” We learn that he wrote his first novel “out of pure coincidence.” That it troubles him that he can never remember his dreams. That reading every day is a reflex and compulsion of quasi-religious significance. That melancholy and humour commingle in his writing as they do in life. We learn the art of noticing, of living as fully sentient beings, in perpetual contemplation.